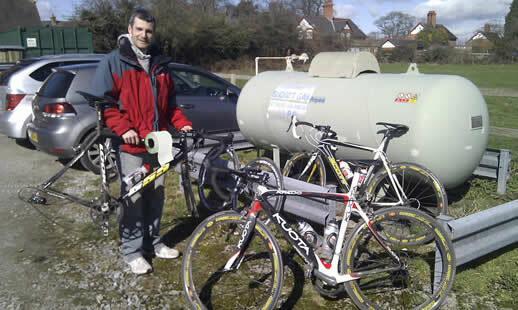 Dunc, Geoff and Tony all took part in the 2nd CDNW race at Saighton near Chester. (No Darren this time as he was too busy in Benidorm drinking pints of Whiskey!!!). We met up at 8am for the drive there in the pouring rain. The forecast was for the rain to clear which it did and brought a great day for racing. There were still large puddles and mud on the course so any chance to stay clean and dry went out the window. Once at the HQ Geoff went off answer the call of nature but was soon back as there was not toilet roll. Luckily, Dunc had some so both then went back to queue up. Once Dunc had finished his business he came out and told Geoff that it was ok as someone had put a new roll in there. Back at the car Dunc and Tony were getting the bikes ready and a pleased Geoff turned up and gave me the ONLY toilet roll that he had taken. Apologies to the rest of the queue that had to use nothing/curtain/hand/ etc, etc. The race was 49 miles on a mainly flat course with 2 small hills in. The race started quite steadily. Dunc had a small effort (mainly to try to get a warm up in) but it all stayed together for about 3 laps with no group getting more than 100 meters away. On lap 4 Dunc got away with another rider for almost a lap (7 miles) the gap never got more than 30 seconds and they were soon caught on the finish climb. With 3 laps to go a group of 4 got away with some strong riders in. Geoff was in a great position as 2 other riders made the effort to get across so went with them as was soon in the break of 7. After a lap they were out of sight and it seemed this was the winning break. A lap later Geoff found the pace on the climb too much as came back to the bunch. The break was within 50 meters of getting caught and then the bunch just stopped chasing and let them get away again. I’m not sure why this happened but it was the final lap and I think people were saving themselves for the sprint as they thought the break was as good as caught. It was at this point Tony called it a day with both legs cramping up on what was the hardest part of the course, a sharp left turn then straight uphill!!! The bunch sprint was dodgy as always with some riders riding head down (almost into the back of a Sunday club run rider that was in the wrong place at the wrong time; I think he may need to borrow some of Geoff’s toilet roll as 60 riders went flying past).